When Jim Klote was a young man, he felt a calling to work for the church. But rather than stand at the pulpit and preach about heaven, he decided to help churches with a much more earthly problem: money. 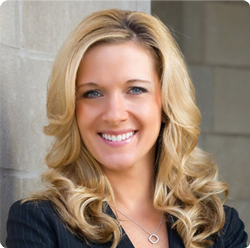 At age 26, Klote went to work for church fundraising consultancy Ward Dreshman & Reinhardt Inc., becoming its youngest consultant ever. He worked his way up to company president in 1997 and defected two years later to start his own business, James D. Klote & Associates Inc., taking most of Ward Dreshman’s employees and clients with him. He kept some ties to Ward Dreshman, however, buying shares in the company over the years, ultimately acquiring the whole thing last year and turning it into a division of his own company working with nonprofits not affiliated with churches, such as YMCAs and private schools – a growing market for his Falls Church company. Today, with dedicated employees and loyal customers, Klote’s business has turned into a major player in the industry. It has raised some $800 million across the country for religious organizations of all denominations. (Klote himself was raised Lutheran, but became an Episcopalian and married a Catholic.) Klote & Associates ranked was the No. 1 church fundraising consultancy in the country this year by Minneapolis research company Volkart May & Associates Inc.
Klote says the distinguishing feature of his company is a set of full-time, on-site consultants who parachute into a town and work, well, religiously at the church. Typically, they stay five to six months and raise $3 million to $5 million. Other times they might be working on a $10 million to $20 million campaign and stay up to a year. The consultants manage the entire fundraising process and train parishioners to go door to door seeking funds from members of the congregation. Donations are usually about $1,000 but have been as high as $5 million. The churches are often raising money to pay for new construction, land acquisition, renovations, deferred maintenance, endowments or mission outreach. But these days debt reduction is the most common theme, accounting for about 50 percent of the campaigns compared with 20 percent three years ago, Klote says. Many organizations borrowed big during brighter economic times to accommodate expected growth, but they are now facing flat or declining philanthropy and straining under the weight of the loan payments. Many churches direct 20 to 50 percent of their annual donations to debt service, Klote says. Churches in a financial bind often cut staff and services to save money, moves that tend to alienate the congregation and depress giving even more. 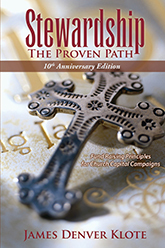 While fundraising is more challenging in downturn than it was a few years ago, the bigger challenge is convincing churches that it is still possible to raise capital in the midst of a recession, Klote says. Klote argues that churches have a rare financial edge: a steadfast audience. 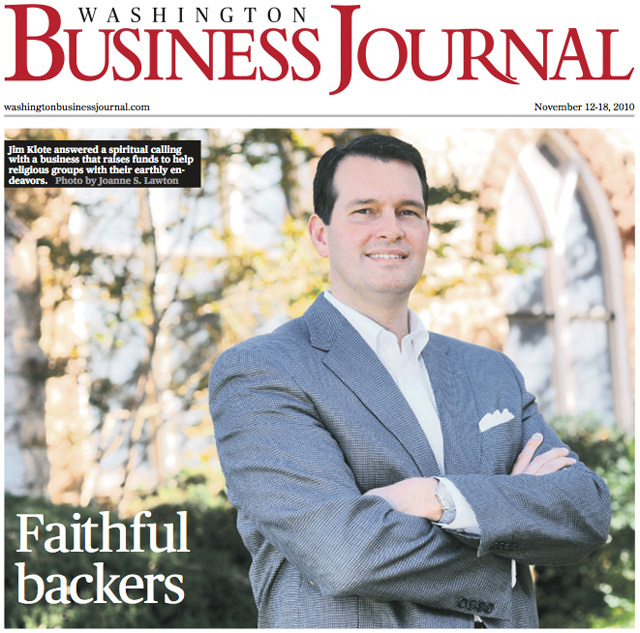 Thanks to the willingness of congregations to give even during a downturn, he says, his own company has seen steady growth through the recession. 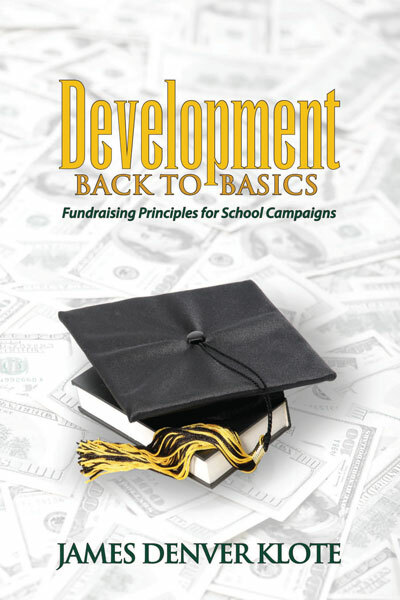 Its fundraising revenue is up 35 percent from two years ago. 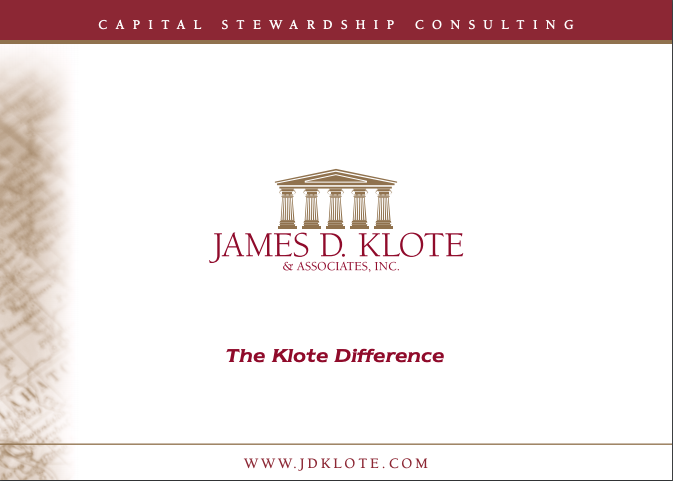 Company: James D. Klote & Associates Inc.